There are two leading ladies in Fog Over Frisco, opposites in every way. Val Bradford (Margaret Lindsay), daughter of a rich banker, is naive, do-good, eager to please. Her stepsister Arlene (the young and vivacious Bette Davis) is headstrong, rash, a fun-loving risk-taker who thinks only of herself. As the story unfolds it's interesting to note how the movie's costume and set designers repeatedly reinforce the contrast. First, through the use of fashion - Val is always well-dressed but sensibly and conservatively. Arlene prefers trendy outfits that stand out in a crowd. In this hilarious juxtaposition Val's propriety is represented by a puritan-style dress whereas Arlene (dare we say it, no bra?) is boldly accented with strips of plaid. ... while Arlene's is starkly Art Deco, all the rage in the 1930s, with a zig-zag mirror frame and geometric waves patterned on the closet doors. The butler brings Arlene a radiogram from a mystery friend about to arrive by ship; she rushes to her bedroom window with binoculars to check out the Embarcadero. Such radio-transmitted telegrams were often sent from ship to shore in the 1930s. 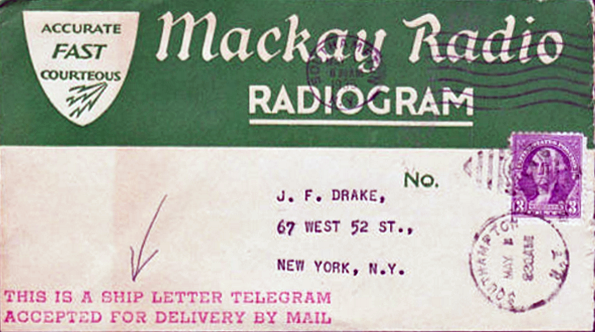 The header on Arlene's tells us that hers came via the Mackay Radio and Telegraph Company; it would have been delivered in an envelope like this one, an example from 1935. Then ... she anxiously scans the piers on the waterfront. From right to left are Piers 33, 35, 37 and 39 with Alcatraz and Angel Island in the distance. This north-facing panorama (part of which was used behind the movie's opening credits) was filmed from the base of Coit Tower on Telegraph Hill (map) but directorial license prevails because, as we will discover in the next post, Arlene Bradford's home was 2 miles away from here. ... and Now, the matching view below as seen from the top of Coit Tower reveals that only Piers 33 and 35 have survived. Pier 37 burned down in 1975 and the original Pier 39 was replaced in 1978 by a tacky tourist mall. Harold And Maude - "What Have You Done?!"